I admit that I’m a curious person by nature (especially anything that has got to do with food) so whenever I drove by the road leading to Giant Hypermarket (and into Perdana Jaya Commercial Centre – where this establishment is located, on the same row as Taste Two Restaurant & Bar) I noticed that the modern looking café seemed packed with customers. So I dragged by partner with me to try them out one evening and that was our mistake. You see, the place has very specific menus for each meal time of the day. So it was unfortunate for us that when we arrived at around 3pm, we were told that they’re only serving tea time menu only (and with limited choices no less). But since we were already there, we might as well ordered what was available and decided upon their Fried Crunchy Wedges (portion was big but nothing special about it, there’s no sauce provided unless requested), Societe’s Chicken Burger (they use real chicken meat instead of a patty which was nice, and also love the fact that their sides includes salads) and their Oreo Cheese Cake (surprisingly good, not too cheesy). I would probably be more enthusiastic about this place, if only they did not overcharged us for a drink that they’d cancelled (yup, you read correctly) due to unavailability. Granted, it was also our fault for not checking the bill thoroughly before paying for our meal but don’t worry, we probably won’t be back anyways. First impression just went out of the window (especially for my parents) when we went there ourselves one evening. It was unfortunate that we were there during a punk+skinhead (very loud and unrecognizable shouts… err, singing) gathering so you could imagined the shock that my 50ish parents felt while entering the place. Personally I’m not that bothered because I do know that the place has a somewhat open mike concept (and a supposedly cultural dance performance every Saturday) but really, it is a bit inappropriate and I was somewhat embarrassed because I was the one that had suggested the place. The eatery was no doubt unique (there’s an actual old house within the said premise, where you could chill out with friends and family in a more laid back setting, other than the usual dining hall outside) but that pretty much got overshadowed by the latter event. I guess I can understand the business side of the situation but I also think that they do need to be more selective as well. I mean, most of the people patronizing the eatery were families with little kids. Another thing that people seemed to comment about the place (unanimously no less) was the pricing of the food, which was on the expensive side. I personally don’t mind high prices just as long as the food was worth it. Unfortunately the food was just so-so at best. We’d ordered their Ikan Masak 3 Rasa (which was a bit overpowering with… something), Deep Fried Prawns (the flour tasted weird though) and their Kangkung Masak Belacan (which resembles the fish in taste for some reason – same wok maybe?) to go with our rice. But don’t just take my word for it. You guys can try them for yourselves at their eatery at Jalan Masjid (right next to a Michelin tyre store and a car wash). Here’s another post that is somewhat related (well, sort of) to my previous post. Now this unique place is called Nukies The Garage Food simply because the main premise is within the compound of its owner’s house (err, I assume it’s the owner’s house anyway). And it might be a bit difficult to spot them at first because they’re somewhat hidden deep within a housing area called Taman Nordin and without any clear signage to tell you where it is. Me and my partner just randomly drive around the area (based on some trusty post from friends of WeChat to guide us) and were able to spot their place. Thankfully the housing area was not that big so you’ll be able to identify the eatery based on outer looks alone (a lot of patrons + lots of chairs & tables). So when I first arrived, I thought that the name of the place sounds familiar. So when I looked back at a previous post that I did in 2014, I found out that they’d previously opened a stall somewhere else but has since moved the business to their own home (which I personally think was a smart move judging from the size of their compound). It’s good to note that they’ll might be some ‘funky smell’ coming from their next door neighbour (which unfortunately owns a plant nursery) and that they’re only open starting 6.30pm onwards (daily except for Tuesdays). Now with that out of the way, let me tell you guys a bit about the food and drinks. Since they’d moved, they have expanded their menus to other western food like chicken chop and meatballs, as well as their staple burgers. Another thing that the place is currently known for was their ice-blended drinks (see the theme here?). We have tried out a few of their Crazy Freakshakes specifically their Oreo Chocolate and Chocolate Brownie shakes. Let me just say that the brownie was super delicious but their drinks? Not so much. It tasted somewhat tasteless to me though. But they definitely can be proud of their food since they’re very delicious in taste although portions may vary. We have tried out their Chicken Chop (love the thick chicken meat), Chicken Meatballs (very tender), Beef Prosperity Burger (it comes with a very tasty BBQ sauce) and their regular Chicken Burger with Cheese. Happy April Fools Day everybody! Rest assured however that nothing about this next post is so-called ‘deceiving’ as this place is as ‘authentic’ as it can be (get it? No? Well… Moving on then…). I’ve notice quite recently that this eatery has been getting a lot of likes within Facebook, particularly for their specialty ice coffee drinks. Now as I was somewhat ‘exposed’ to quite a number of similar beverages as of late, I was a bit skeptical coming to the place. But then again I just got to know what is so special about it so I practically dragged my partner to the place one afternoon. Oh and by the way, the café is located at the newly built single row shops right next to Giant Hypermarket called 1Arena Commercial Centre (or is it BDC Commercial Centre? I’m confused by the signage though). We were quite lucky to have arrived during brunch time so the place was still pretty empty (but it took around 10 minutes after we’d arrived for the place to be packed with people). So since I have no idea what to order, I just randomly picked out the Milo Monster Kaw Kaw drink from the menu and when it came to my table a few minutes later, I was truly blown away… by the size of the drink! I mean, you can’t probably see it from the picture below but all I can tell you was that there’s a reason why their ice-blended drinks costs around RM5.50 and up (it’s big by normal standard). And the taste was not disappointing as well. It’s refreshing and delicious to boot. No wonder people were raving about them! 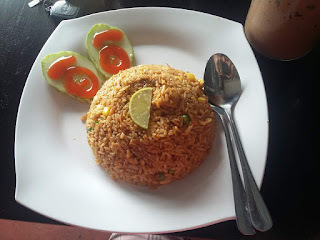 We also tried out some of their food (we’d ordered their Nasi Goreng Nenas and Kuey Teow Goreng) but it was only average at best in both taste and service. Choices of food were also not as extensive as their drinks, maybe because they’re playing by their strength.